Beer is the world's oldest alcoholic beverage--people have been drinking it and sleeping with ugly people since 3500 BC, and it's probably why most of us are here--so there's not a lot of innovation going on with the actual beverage. Now Heineken, in an effort to take a bigger slice of North America's US $9 billion beer market, is innovating through packaging. Their first step was the 4.75 liter mini-keg, which was probably around in Europe since the Dark Ages but which only made it to American shores in January. 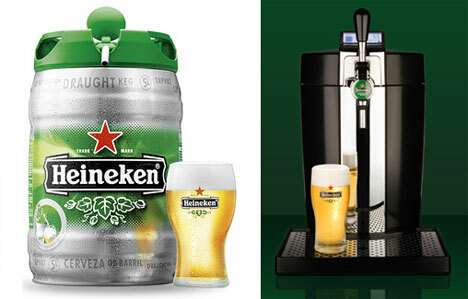 This fall Heineken bumps the mini-keg up to an even five liters and is currently testing out its BeerTender, another product available in Europe for years but only now coming to the U.S., in Rhode Island. The idea behind the BeerTender, which is essentially a countertop cappucino machine for beer, is to create more "usage opportunities" for the mini-keg. Whereas most college students have no problem getting rid of a mini-keg in 30 minutes, it will actually keep beer fresh for 30 days, and the Rhode Island trials are aimed at people who aren't trying to get laid at Kappa Gamma Phi; adults can use the BeerTender to have draught beer in the house, one sensible glass at a time. And, for reference, these minikegs have been around in the US since at least March/April 2006. I only say that because I was drinking them at the time. I love living in Rhode Island.